Download the Android App and Sign-up. Click on Add Money & add Minimum Rs.50 to your Wallet. Make payment using any Visa or Mastercard ATM / Debit / Credit Card. 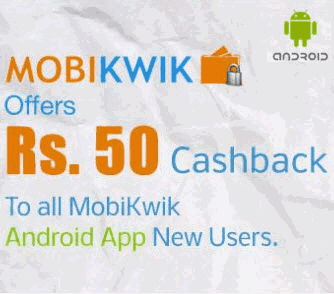 Proceed with your Recharges, Bill Payments & Wallet Offers on MobiKwik. Mobikwik Wallet is a world of convenience. Recharge your phones, pay your bills, buy stuff. Use MobiKwik Wallet to pay at our Merchant Partners - in their apps or websites with a single click.